Spring is slowly coming to our area ... its nice and sunny today!!!! Just can't wait to see the flowers blooming again...new leaves with pretty green and bird chirping all day long. Here is a happy HELLO card using new Paper Smooches- Bold Buzzwords set. I ♥♥♥ this sentiment set!!! I also added the "Friend " from PS-Swanky Snowdudes. The fun dotted border from PS-Alphadots . I used Hero Arts stencil and Distress inks to create the background, then splatters a few drops of water over it for fun effect. Paper Minutes: Sentiment as focus. Next card is with FUN diecutting!!! If you put two straight quote dies from PS-Quotables die set together ...you can get these fun arrow shapes. I used Carta Bella- Celebration papers to die cut these arrows. The sentiment & stars are from the same PS- Bold Buzzwords set. Fab 'n' Funky - Masculine. I'm so enjoyng guest designing for Paper Smooches this month!! Don't forget to check out the PS Blog for amazing DT inspirations. oh I love your cards!!!! 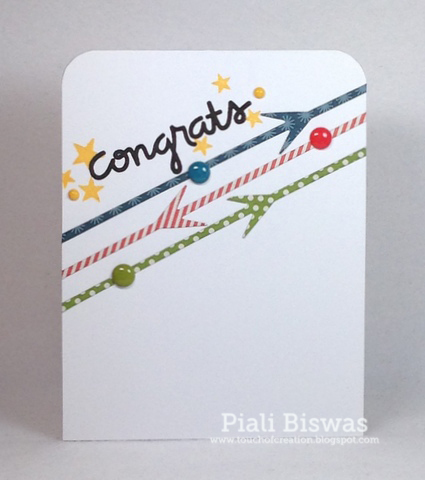 Piali both of your cards are fantastic!! Awesome card! Love the colors and the pop! I also love using water over my inks to get those great spots! (I love your second card, too! )Thanks for participating in our Make Something Monday Challenge over at Where Life Meets Art! Papertrey March Blog Hop Challenge!!! A Challenge and a Giveaway!!!! CFS New Release Day #2!!! CFS New Release Day #1!! !